Three years in the making, Lucid has achieved Matt Stevens’ goal of wanting to make a significant step forward from his previous solo albums. 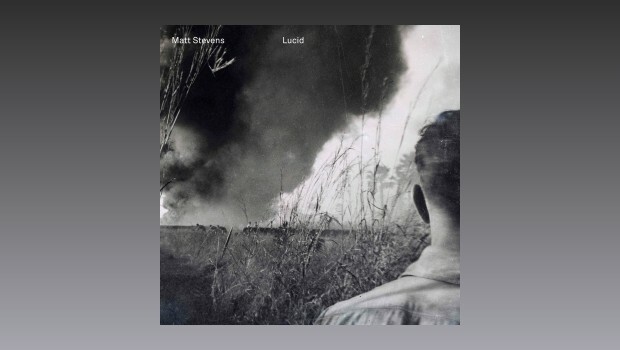 Despite being inspired by some dark times for Matt, it is certainly an uplifting listen that displays his myriad musical influences in his own way. This is in no way symphonic and in many respects it isn’t even prog, the grounding is in a much more ‘punk’ attitude and roughness to the sound that lets the energy and ‘liveness’ of the playing shine through. There has been a marked change in the feel of the music since Matt’s previous solo albums and he has clearly been influenced by his experiments with The Fierce And The Dead and his more eclectic side as there is much more spikiness and energy, the superb looping guitar now one of the factors in producing the sound rather than the main focus. This shows a definite maturity in Matt’s composition and having the ability to be able to assemble a group of high quality musicians to help him out has made Lucid resonate with striking performances, rhythms and melodies. 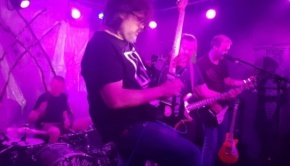 There are contributions from Pat Mastelotto (King Crimson), Lorenzo Feliciati (Naked Truth), Charlie Cawood (Knifeworld), Jem Godfrey (Frost*), Emmett Elvin (Chrome Hoof/Guapo/Knifeworld), Chrissie Caulfield (Crippled Black Phoenix), Jon Hart, Nicholas Wyatt Duke (Trojan Horse) plus old mates Kev Feazey and Stuart Marshall from The Fierce And The Dead. Lucid comes out of the traps as a very different beast to what might be expected and opener Oxymoron certainly shows the influence of The Fierce And The Dead, drummer Stuart Marshall linking well with bassist Cawood and Caulfield’s violin. After the initial onslaught Stevens adds layers of guitar before the intensity builds again. Flow eases the intensity and sees a return to the solo looping, the track doing exactly what it says on the tin and flowing nicely. Whilst there are hints of Steve Hackett in the quiet bits, Battles and The Fierce And The Dead are always near at hand with Stevens’ energetic twitchiness evident. This is followed by the angry entry into Unsettled which references Red era King Crimson. Matt’s eclecticism shines through and fans of his earlier solo releases may struggle with this one. For me though the influences and spiky anger within the repetitive loops makes it all the more appealing. It would have been appropriate if this was the track that Pat Mastelotto appears on but in fact Stuart Marshall is manning the drums here, working well with Cawood’s overdriven bass. The power doesn’t get in the way of the melody and there is an intent to Unsettled that will have your face off if given half a chance. 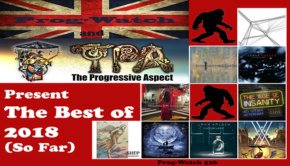 Generally acoustic and much lower key but with a slightly sinister edge, The Other Side is more of a ballad that builds on a melodic line and multi-tracked guitar rhythms. Percussion adds spice as the track moves through its phases, Stevens’ clipped guitar tone is a change and there’s plenty going on in the background and quieter corners with Matt’s experimental leanings never far from the surface. The Ascent has a definite King Crimson vibe to it and, indeed, this is the track where Pat Mastelotto provides his trademark percussion, linking well with Feliciati’s bass. Jem Godfrey also appears here supplying the keys. The rough tones add to the unsettling nature and Matt goes into overdrive on an Adrian Belew-esque solo with metallic overtones that blows things open before more Fripp style angularity. Pat is a force of nature on this and Matt matches him in intensity, this is very much Stevens going with what is inside him rather than feeling that he needs to make a certain kind of album based on past responses. Another change of mood and a soothing balm after the craziness and testosterone of The Ascent, Coulrophobia features the dreamy vibraphone of Jon Hart mixed with pensive and bubbling hallucinatory sounds. Matt’s solo cuts through the gently vibrating loops, the languid mood all pervasive but with a woozy, off-kilter feel before a slow fade. The variety within the album is striking but Lucid doesn’t become unfocused and carries the listener along through it’s changes of mood and feel. The title track features more KC spikiness, courtesy of the original TFATD trio of Stevens, Feazey and Marshall, and sounds like it could have come from the Spooky Action sessions. Feazey excels on a thumping four on the floor rhythm which drops away for an ascending scale from Matt – the spectre of Bob Fripp sitting in the shadows, nodding knowingly. Fuzzed up guitar buzzes around like a demented bluebottle and there is bags of energy here. You feel that it could happily go on for ages without getting tedious but the abrupt stop throws the listener sideways. One of Matt’s real gifts is that he likes to keep things sharp, punchy and to the point, successfully holding the listener’s attention and not trying to simply show how good he is at what he does. As with all the best pieces it is the music itself which is the most important thing and the players themselves fall in line behind that. KEA is a much more traditional solo acoustic piece, Matt taking the bright melody with a folk edge and adding Mahavishnu/John McLaughlin progressions that show a very different influence. With a crash, drums return briefly at the start of Street And Circus before Stevens’ strumming takes over the rhythm for a chiming lead to emerge. The layers of guitar are very satisfying here and this is predominantly Stevens alone other than for the drum sections which return towards the end to carry things out on a hypnotic chorus of chiming guitars. A quite lengthy track, Street And Circus acts as a preface to the “epic” The Bridge which at nearly 12 minutes is a new road for Stevens. It comes in snarling and moody on a very muscular rhythm – this is certainly an album for the more cathartic sounds in Stevens’ arsenal. Sonic Youth morphs into Mahavishnu Orchestra as the violin of Chrissie Caulfield emerges coupled with Matt’s sustained lead. This gives way to an ethereal section with undulations of picked notes; cool shards of iciness over a warmer rolling backdrop. The mid-section sees mournful acoustic guitar emerge as the backing falls away, the stage set for Matt to solo above. There is an almost classical elegance to this section which is quite beautiful and it comes as a shock when the pounding, fuzzed up rhythm returns for a rocking second half interspersed with layers of electronica-like guitar, the hypnotic feel reminiscent of the sounds of a long rail journey. The track ends with a joyous exuberance and masses of positive energy. To finish, A Boy sees a return to the easy going looped acoustic with a playful melody portraying the wide eyed innocence of the youth of the title; a fitting end to a positive step forward in Matt Stevens’ musical journey. The numerous influences from the more eclectic end of the spectrum that have driven Stevens through his development and experimentation are heard within every note and phrase. This is a modern instrumental album for people with eclectic tastes that are prepared to try something different. Some of what made Matt’s previous solo albums so satisfying has been dropped but what has replaced those elements has probably given the album more legs. It isn’t so much a showcase for what Matt can do technique wise, more so it is about feel, passion and finding an outlet for the music that inspires him. 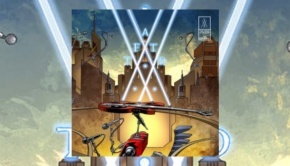 The development of TFATD has clearly made a massive impression on Stevens and he has integrated a good bit of the feel of that band into his solo work. Lucid is a rock record, no doubt about it. It grows in stature with repeated listens and where previous albums chimed, this one crunches and fuzzes with enough ‘Oomph’ to scare even the hardiest soul. The proto-band elements of Ghost which were developed on Relic have come to full fruition after Stevens’ forays with TFATD, this album is in the main closer to Spooky Action than Matt’s previous solo work, the nearest pointer there is likely to be Frost from Relic. Lucid is a different focus on Matt’s playing and a chance to look at his work from a different angle. The King Crimson elements have always been there but they are certainly more pronounced and cathartic here, the mix on energy and elegance making for a fine listening experience that will no doubt bear many repeated plays.